What is Funny Car Racing? The concept is definitely a strange one and the answer is not, contrary to popular belief, a clown car convention. 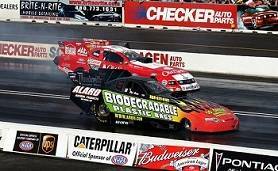 Funny car racing is a drag racing class that is popular in the U.S. These cars are propped up on forward mounted engines and carbon fibre bodies that are balanced over the chassis. 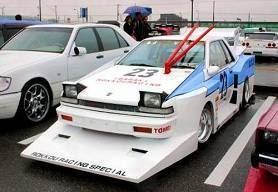 Although it can look incredibly strange seeing these funny looking vehicles racing against each other, high speeds are reached and it is considered a very serious sport by those involved in the industry and by those who take part. There are, of course, many other vehicles used and the each one looks just as strange as those that came before it. The first vehicles were put together around 1965 and were referred to as ‘funny’ cars because the back wheels were moved forward on the chassis to improve the weight transfer when the vehicle accelerates, which in turn causes traction on the back tyres. The back tyres were much bigger than normal, making the cars look even sillier. Funny vehicles produced years ago are still raced today under the NHRA Heritage Hot Rod Racing Series and certain events including the National Hot Rod Racing Series and the California Hot Rod Reunion. To maintain uniformity as well as safety, there are many guidelines and rules for funny car racing. The following are a few brief, summarised versions of some of these guidelines. Intake valves are usually made out of titanium of a 61 mm width of Inconel. Check this amusing video clip of a Funny Car Racing driver trying to re-gain control of his vehicle after the steering wheel comes off. 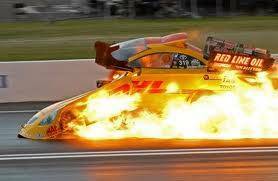 How powerful are funny cars? The answer to this question varies widely depending on where you look. The general average of the engine is about 8000 horse power. The torque produced by supercharged, nitromethane fuelled engines is usually around 9000 Nm. This competition is incredibly popular and competitive in the funny car drag racing world. The NHRA Top Fuel Funny Car Championships have been going since 1974. What are the other professional classes?